Gu Fan Hui, dubbed "Beijing's most ancient temple fair," will kick off in the western suburbs of Beijing on Feb. 24, the Lantern Festival. The two-day festival, with a history of over 1,000 years, is the best-preserved and most special folk activity the city has to offer. The festival features classic and traditional music, plus traditional culture and customs of the Ming (1368-1644) and Qing (1644-1912) dynasties. There's a 500-meter-long parade accompanied by traditional music, showcasing the art of flag-balancing, with a man trying to hold a huge flagpole upright for as long as possible. 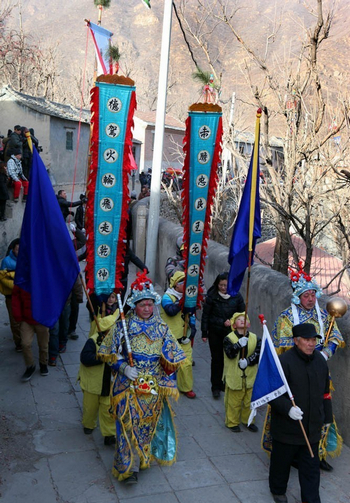 Most remarkably, the festival, hosted by the locals of the Qianjuntai and Zhuanghu Villages, is a pure and authentic local celebration without any commercial elements. This self-entertaining activity is one of the most precious intangible cultural heritages in the capital.